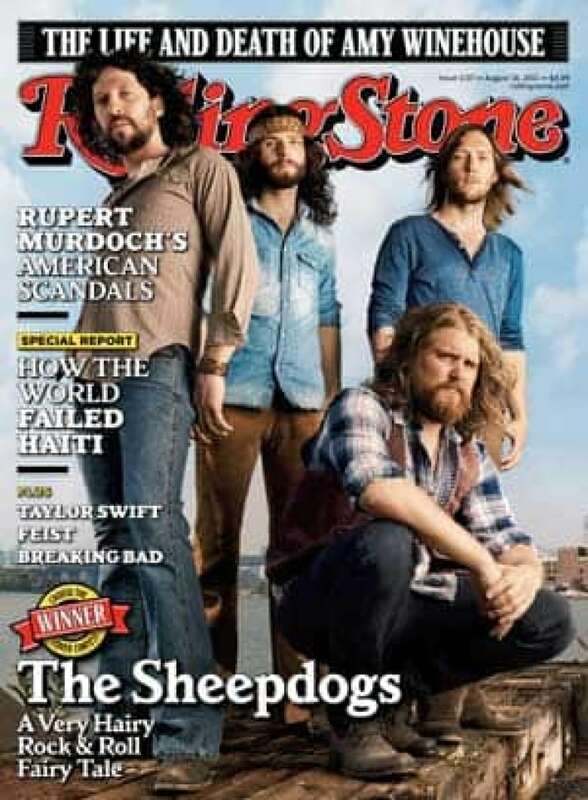 Saskatoon rockers The Sheepdogs are gracing the cover of Rolling Stone after winning the first contest to appear in the iconic music magazine. The quartet beat out 15 other competitors to win Rolling Stone's "Do You Wanna Be A Rock & Roll Star" contest, which let readers select an unsigned musical act to be on the magazine's cover. The winner was announced Monday. "I am so freaking ridiculously excited," Margi Corbett, the mother of Sheepdogs drummer Sam Corbett, told CBC News on Monday afternoon. "It's been a long time. It's been a long competition," she added. "It's been an awful lot of pride and expectation and ups and downs and hanging in by our fingernails, and we are so thrilled and we are so proud." The Sheepdogs are a previously unsigned band comprising lead singer Ewan Currie, guitarist Leot Hanson, bassist Ryan Gullen and Corbett on drums. In addition to appearing on this month's issue of Rolling Stone, which hits newsstands on Friday, the band is also getting a deal with Atlantic Records. As well, it will perform on Late Night with Jimmy Fallon on Tuesday, according to Rolling Stone's website. A massive billboard of the magazine's cover was to be unveiled Monday night at an event in New York's Times Square. "They're probably being wined and dined right now with the Rolling Stone editors in New York. I'm sure that they're being treated very royally," Margi Corbett said. The band will later embark on a Canadian tour with Kings of Leon. Rolling Stone publisher Matt Mastrangelo and managing editor Will Dana broke the news to the band at the Brooklyn Navy Yard, where the cover photograph was shot, according to a video posted on the magazine's website. The Sheepdogs, who describe themselves on Twitter as specialists in "melody, harmony, guitar solos and general feel-goodery," were the only Canadian band in the competition when it began in February with 16 acts. The contenders were whittled down through online voting to two finalists. Los Angeles singer-songwriter Lelia Broussard was the other finalist. Broussard's soft, guitar-strumming tunes are a marked contrast to the hard-driving, rollicking rock offered by the Sheepdogs. There was apparently no love lost between the two acts. In an interview with The Associated Press, Currie said of Broussard, "She could be rather sullen and not particularly friendly." Both acts battled it out at the Bonnaroo Music and Arts Festival in Manchester, Tenn., and in the end, readers showed their preference. Currie said while Rolling Stone has had its share of pop acts over the years, The Sheepdogs probably best embody the magazine's spirit. "In the end, rock 'n' roll won," he said. The Sheepdogs, all in their 20s, are being introduced to the masses now, but they have been around since 2006. They have released their albums independently, are regular road performers and have a website. "We were helped by the fact that we are experienced and we have been running this operation," Currie said. "We were fully formed … we were ready to seize it." The group is excited to be on Atlantic Records and to have access to the resources a major label can offer. But band members are hoping the label won't try to change them too much. "Ultimately we want to put out a record that represents us, and we don't want to change … so if it changed, it would be a shame," he said.